…) I had the pleasure of learning about an experiment devised by my colleague, Jon Powell, that illustrates why we must never assume that we test in a vacuum devoid of any external factors that can skew data in our tests (and even looking at external factors that we can create ourselves). If you’d like to learn most about this experiment in its entirety, you can hear it firsthand from Jon on the web clinic replay. SPOILER ALERT: If you choose to keep reading, be warned that I am now giving away the ending. So after reanalyzing the data and adjusting the test duration to exclude the results from when an unintended (by our researchers at least) promotional email had been sent out, Jon saw that each of the treatments significantly outperformed the control with conclusive validity. (…) I had the pleasure of learning about an experiment devised by my colleague, Jon Powell, that illustrates why we must never assume that we test in a vacuum devoid of any external factors that can skew data in our tests (and even looking at external factors that we can create ourselves). According to the testing platform Jon was using, the aggregate results came up inconclusive. None of the treatments outperformed the control with any significance difference. However, what was interesting is the data indicated a pretty large difference in performance with a couple of the treatments. The Apple & Microsoft Brand Strategies – What Do You Think? Yesterday, Apple’s market capitalization eclipsed that of Microsoft. Their rivalry has fascinated me since I was old enough to geek. Apple has always been about control of the experience. Microsoft in its hey-day about control of the industry. Things they are a changing. So what about their brand brand strategies? The Microsoft brand position has always been that of Number One – The market leader. This is a brand position that works for pathetic reasons. People want buy safe so buying from #1 seems like the safe choice. 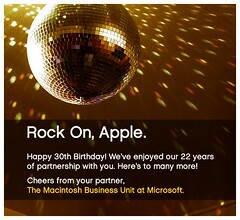 But Microsoft never channeled this dominance into a concrete brand position. They drank too much of their own cool aid and believed their solutions were more competitive than they really were. Being big has led them to being a big mush of meaning, being so many types of software, hardware, services, and systems they have no brand focus. What we here at Distility refer to as “over-branding”. As their dominance has waned, their brand position has deflated to the pathetic “I’m a PC” campaign. Yes, their are some exceptions like the X-Box, but I’d argue that they essentially created a Masterbrand with X-Box, with “Microsoft” being treated as a lesser endorser brand. There’s a future in that. What lies ahead for Microsoft as they succumb to second place? I see the Microsoft brand moving to the background so more focused brands like Zune, X-Box, and Windows can be accurately positioned vis-a-vis the competition. My first Apple was the Mac 512/800. It was the easiest computer I’d ever used. That’s what made it different back then. Every Apple product I’ve used since then has maintained that dramatic difference. Steve Jobs knows the integral role that design can lead in brand differentiation. While they couldn’t be market leaders like Microsoft, Apple became the thought leaders with ease of use their weapon of choice. The “I’m a PC/Mac” campaign was the ultimate expression of that brand position. Positioning is all about being positioned relative to a competitor, so what happens as the competition gets easy to use? Can Apple sustain this position indefinitely? Yesterday, Apple‘s market capitalization eclipsed that of Microsoft. Their rivalry has fascinated me since I was old enough to geek. Apple has always been about control of the experience. Microsoft in its hey-day about control of the industry. Things they are a changing. So what about their brand brand strategies? Autor Gabriel Catalano - human being | (#IN).perfección®Publicado el 28 mayo 2010 Categorías Sin categoríaEtiquetas Add new tag,Apple,Apple + Iphone + Ipad,Bill Gates,Bing,Brand,Distility.com,IPad,MacPaint,Microsoft,Microsoft,Personal computer,Steve Jobs,Steve Jobs1 comentario en The Apple & Microsoft Brand Strategies – What Do You Think? 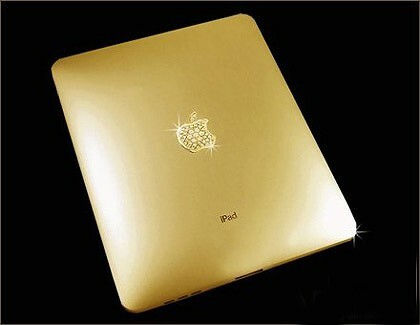 Golden delicious … The gold-plated iPad Stuart Hughes has for sale. While Australians wait with twitchy fingers for their regular iPads to turn up, a British designer who caters for mega-rich geeks has unveiled his latest creation. Behold the solid-gold iPad Supreme Edition, worth about $215,000, which gives you Wi-Fi, 3G, 64GB – and a whole lot more. Encrusted with 25.5 carats of flawless diamonds, 53 of the gems “dwell beautifully in the solid 22ct Apple logo”, seller Stuart Hughes said. Encrusted with 25.5 carats of flawless diamonds, 53 of the gems “dwell beautifully in the solid 22ct Apple logo“, seller Stuart Hughes said. // The rear and screen surround are made from a single piece of solid 22ct gold, weighing 2.1 kilograms. “A magnificent combination of top-of-the-industry technology and unrivalled craftsmanship was involved in creating this masterpiece”, is how the creation is described on Hughes’s website. Only 10 of the units will be made. The ultimate iPad follows some of Hughes’s other creations, which include the world’s most expensive phone – an iPhone reputedly worth more than $3 million. There’s an alarming perception in business, one that supposedly dictates that small businesses can’t become highly profitable. It’s surprisingly common, rarely questioned, and almost completely wrong. What the internet has shown us — particularly in the last five years — is that ultra-small businesses can often be some of the most profitable in the world. A great example that comes to mind is 37Signals‘ insistence on keeping things small with only 19 employees, allowing their company to remain manageable and still immensely successful. The biggest online successes of the last five years haven’t been press-grabbing Web 2.0 services (many of which remain unprofitable), but smaller businesses that offer innovative products. There are big opportunities out there, even for small and specialized design businesses. Few industries are as primed for expansion and scale as web design. With a successful sales and marketing routine in place, gaining extra income can be as simple as hiring, researching, and delegating. From contracted designers to highly optimized business processes, scaling an online business tends to be a significantly less stressful process than expanding a more traditional offline company. Eyeblaster ya publicó su último estudio respecto a la publicidad en las aerolíneas. Entérate qué viene y dónde están las mayores fortalezas. “Mientras el negocio de dirigir una línea aérea se ha mantenido más o menos igual durante la última década, la venta de billetes y la ocupación de los asientos ha cambiado drásticamente. De los muchos sectores afectados por la proliferación de Internet, pocos han tenido un impacto tan grande como el de los viajes y las líneas aéreas en especial”. Así comienza el último informe del proveedor de soporte multimedia para publicidad online Eyeblaster, denominado “Estudio sobre la Publicidad Digital para Aerolíneas”. I’ve been on Twitter for about 7 months and on Facebook for about a year or so. What I’ve noticed is that there are an increasing number of people sharing information on both these sites. With the opening up of Facebook’s social graph and Twitter acquiring companies that makes third-party services for them, it seems like this trend is going nowhere but north. Social media has led to “social sharing,” the broadcasting of our thoughts and activities. It’s not a fad; it’s a sociological phenomenon, accelerating at break-neck speed. That macro trend is omnipresent sharing: What are you doing? Where are you doing it? Who are you doing it with? What do you like? These used to be things we kept to ourselves or shared with our friends and family. Now we’re willing to broadcast them to whoever is willing to listen. Still think social media is a fad? For those who haven’t seen it, Jeremy Webb wants to kick off this week’s update with the following clip: A Social Media Revolution (CN subtitles).